I have finished the first of many projects, I hope, from Knitting in the Old Way by Priscilla Gibson-Roberts. As I said, this knitting journey is to be a learning experience so let me tell you what I have learned. 1. Tah-dah- Gussets!! I never thought that I would be so excited by something that went under the arm; but I had never made a gusset before - not only is it easy to knit, it is also comfortable to wear. 2. Weeee - welt-hems. Quite easy at the beginning except that care must be taken when putting front and back onto one circular needle. I managed to lose some stitches off the end of one needle and therefore spoiled the join on one side. Also lap the front of the sweater over the back on both sides when joining the welts - oops I found that out after blocking. Knitting the sleeve from the top down and then trying to create a matching welt hem at the wrist was not as easy. I did work out an acceptable method. Let me know, if you are doing this. I can at least tell you what I did. 3. Slim sleeves - I didn't really get them, because I should have started my sleeve decreases about 6 rows earlier. I am still in awe of the difference 2 stitches less can make to the look of an entire sleeve. The grand scheme of things is made up of so many minutiae -"sweat the small stuff". Also I should have picked up 2 stitches for 3 rather than 4 stitches for 5 along the armhole opening. This would have given me fewer stitches to start the sleeve with as well. 4. More swatches - I probably should have done more of them or taken time for more complete graphs because I am not that impressed with the way the large diamond in the centre front blends with the rest of the design. I think that I should have started the larger centre diamond earlier then I wouldn't have had those 2 little mouths waiting to take a bite out of the intruder. 5. High neck - although I like high necklines, I think that the charm of this garment is in a slightly lower neckline which will not happen even if you start the large diamond earlier. It needs a whole new approach. 6. Busy brocade - More swatching might also have shown me that although I liked knitting the changing diamond pattern, aesthetically a simpler more open diamond pattern would have been more elegant. 7. Squared off at the neck - a sneak peek at the directions of the natrojer by Beth Brown-Rientzel in interweave knits Winter 2004 showed that the mitered corners were made by decreasing 2 sets of stitches beside each other at the 4 corners. However, it is important when doing seed stitch to make sure that the knit decrease is in a certain position beside the purl decrease so that the mitered slants compliment each other at the corners. 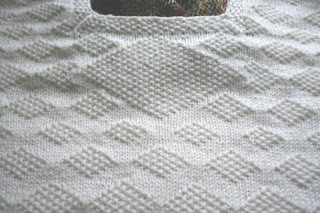 The knit stitch makes the dominant ridge. I won't tell you how many times I re-knit the neck border! 8. Increased increases - I re-worked my increases several times until I found one that wouldn't give me holes at the hem or bunching in the gusset (sounds like the symptom of an awful disease). Also I almost wore out my crochet hook correcting mindless errors in the seed stitch diamonds. I just got lost in thought and didn't think - does that make sense? 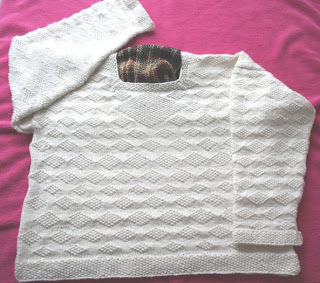 I know I said knit along with me if you like and then I raced ahead; made a lot of mistakes - so you won't have to and now I am going to re-knit the blouse - actually the longer version - with the corrections. The longer version can really be the second sweater in the book, so we are heading in the right direction. Now, what yarn should I use? What colour? I’m in the process of doing some massive ring maintenance for the FiberArts Bloggers ring and I am contacting you because there’s a problem you may have noticed with your code. You're missing anyting to identify what code you do have up as belonging to the FiberArts Bloggers ring. I will go ahead and e-mail you the basic ring code now, but if you don’t get it please let me know. Please feel free to contact me with any questions/concerns. Once you have your code up, if you want to send me a note I’d appreciate it, so I can check it out. Thanks!